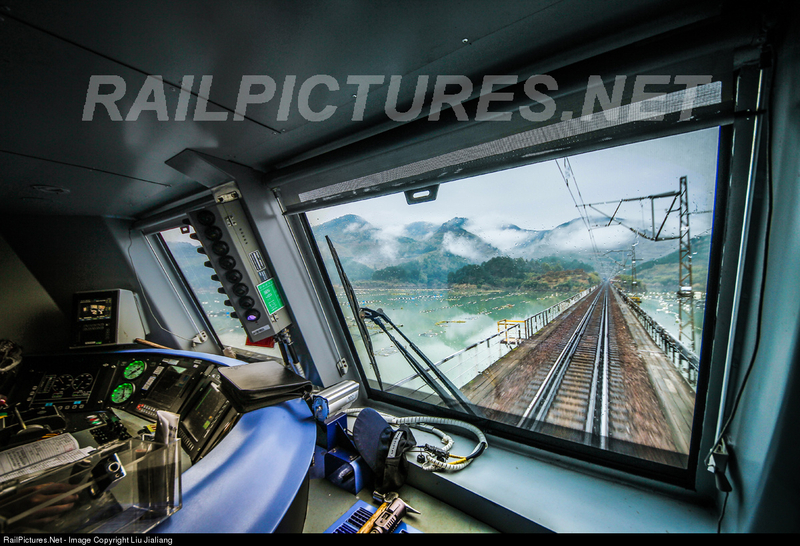 I noticed this photo taken inside the cab of a Chinese HXD1C electric locomotive and immediately a number of interesting tidbits caught my eye. Let's take a moment to step through them. First my eye is drawn to the center of the cab and if I know my cab signal displays, that's a cab signal display with 8 bulbs. Now each cab signal aspect may use multiple bulbs, so I can't tell how many cab signal indications this unit can display, but I believe it would be more than four. There is one purple lamp lit and I know that, like France and the NY Central, China does does purple as a Stop indication at least on dwarf (shunt) signals. By looking out the window we can see that the train is moving along the track at a good clip, however by looking at the centenary structure and condition of the concrete we can infer that the line has seen some years. So what does this all tell us? Well, we have a new model locomotive running at speed down a moderately old rail line with the most Restrictive cab signal indication displayed. While China isn't big on safety, I don't this we're seeing a stop signal violation, instead the line is not equipped with cab signals. In summary, China is a lot like the United States. It has deployed an aspect based cab signal system with many new locomotives being equipped with the hardware, but for whatever reason the system has not seen universal adoption, or even adoption on all major rail lines. Rail travel is the one and only thing which will be loved by all as the way of traveling has been really awesome and wonderful which will be loved by all aged persons. Right from children to old aged persons they will love to travel in train as the journey will not create any sorts of tired and also there will be more enjoyment. This has been experienced by myself while i have been traveling in bullet train in Japan, where i went to meet one of my custom writing paper research clients i had supposed to travel in train as one of my clients were staying in a forest covered natural area and as that area can be covered with the help of train journey only, i had started the train journey and in that journey i had conquered so many natural sceneries and gained a new piece of experience. jersey Mike, I have been following your blog for years and for whatever reason tonight was the the first time a way of adding a comment was provided without having to sign up for something else. I might have information to contribute relating to other topics you've created posts about, please contact me as time allows crquality (at) hotmail dot com. Thanks!